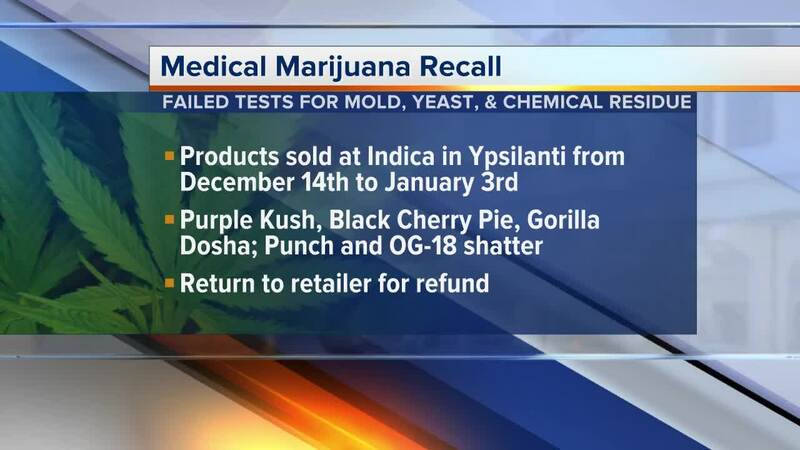 YPSILANTI, Mich. (WXYZ) — The Licensing and Regulatory Affairs Department issued a health and safety advisory Friday in Ypsilanti. Marijuana products sold from Indica, LLC located on Huron River Drive have been recalled due to failed laboratory testing. Officials say the products were sold between Dec. 14, 2018 and Jan. 3, 2019. Caregivers or patients with any of the above affected products should return them to Indica, LLC for proper disposal.